A time of struggle, intrigue, and horror. A divided country, where the upper class enjoys the bounty of wealth, and the poor cannot afford a loaf of bread. Where the cries of anger and rage at life's injustices find momentum, sparking the people to unite and cast away the old regime for a brighter and more hopeful tomorrow. In time, hope will be replaced with fear as The Terror descends upon France, and the guillotine cries out for blood. 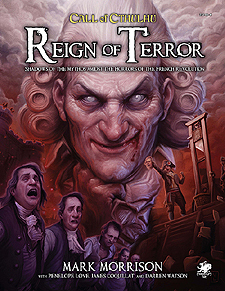 Reign of Terror is an epic two-part historical scenario, set during the French Revolution, playable as a stand-alone adventure or as an historical interlude for use with Chaosium's premium campaign Horror on the Orient Express. This book provides a stand-alone setting, with a plethora of historical details to help the Keeper bring the Revolution to life, as well as new investigator occupations. Alongside the scenarios of Reign of Terror is a range of scenario seeds, each providing roots for extending play and building a longer, more in-depth campaign. If used with Horror on the Orient Express, this book provides an exciting and action-packed "living handout" to engage players in the full horror of the Comte Fenalik at the height of his powers, bringing new insights into the parent campaign. For use with both options of play are six ready-to-go pre-generated investigators, as well as a full timeline for the French Revolution, luscious full-colour maps of Paris, Versailles, and other locales, and a bibliography for further research and reading.